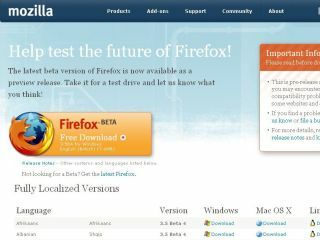 Firefox 3.5 will continue to take market share from Internet Explorer, according to Mozilla's Vice President of Engineering Mike Shaver – with honesty and user focus still the main aim in an increasingly competitive environment. Firefox is closing in on a quarter share of the global browser market and Shaver is not concerned by the running battle with the likes of Google, Apple and Microsoft. "It's a new competitive environment and we're seeing that the things we have been doing with our browser - like focusing on the user, being genuine in our communication and talking about where we're second, where we're first or third - continue to be received well," said Shaver in a lengthy interview with TechRadar. "These things continue to push us in the right direction with our product. "In that sense it's more of the same, but it is nice that there are more people now that are talking about these things; it's not just Microsoft the incumbent and this scrappy crazy non-profit [organisation]. "There are other companies that are seeing the strategic value of the browser again and that really helps the conversations." Shaver firmly believes that strong web standards and the fact that Mozilla is not scared of running with ideas that first appear in other browsers help keep Firefox at the cutting edge. "Some…things we've seen in other browsers and we've worked with them – some of the transforms we've seen in [Apple/Konqueror's] WebKit, some of the offline service we saw as a plug-in in [Google] Gears, but we've helped to bring them to a more standard state and we're using our market reach to bring them to more people. "There's nothing shameful about using other people's ideas; the shameful thing is not improving the user's experience because you're jealous or you don't want to look like you're following. "I think that for a lot of companies their success and mental image of themselves is predicated on the fact that the smartest people in the world are in this building – that they have the best. "Google is legendary for it, but not unique to it with Apple and so forth, but our success is predicated on the fact that the smartest people are everywhere and they can't all be working for us."